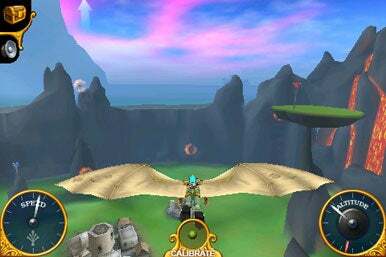 Glyder by Glu takes you on a mystical journey in which you fly through enchanted islands beautifully rendered in 3-D. You play the part of Eryn who has found herself trapped in a dimensional rift, trying to find a way back home. Your mode of transportation: an apparatus resembling wings that allows you to peacefully glide around stunning landscapes. Come Fly With Me: In Glyder, tilt your iPhone or iPod touch from side to side to steer, and pull back to gain altitude. Glyder uses the iPhone’s accelerometer to control your flight path. Just tilt left or right to steer and pull back to gain altitude. If you need more speed, simply tilt forward to go into a dive. Around the different islands you’ll find thermal pockets or updrafts that propel you high into the sky as well as speed-boosting crystals. The game’s controls are very simple and have a natural feel to them, making for an enjoyable experience. Glyder features several missions you must complete across six different islands before you can open a portal that will lead you back home. Collecting crystals seems to be your main objective but there are also mini-missions—time trials or flying from one platform to the next. With more than 2,000 crystal to collect and many achievements to shoot for, Glyder provides many hours of gameplay. The graphics in Glyder are just stunning, and the soothing soundtrack sets the perfect mood. A free version of Glyder gives you an idea of what the app can do, but at $2, this game is a definite download. It’s currently one of my favorites. Glyder is compatible with any iPhone or iPod touch running the iPhone 2.2.1 software update.